Synopsis: One dark night on the island of Great Saltee, fourteen-year-old Conor is framed for a terrible crime he didn’t commit. Thrown into prison by the dastardly Hugo Bonvilain, Conor is trapped in a seaswept dungeon and branded a traitor. He must escape and clear his name; he wants his old life back – his family, his friends . . . and his princess. Conor knows there is only one way out. It’s an impossible task, which has never been done before. But Conor is determined to do it. He’ll have to fly. Conor Broekhart was born to fly. More specifically, he was born flying- in a hot air balloon in the 19th century. All his life long, he has dreamed of construct a glider. But just when there is a glimmer of hope, his chances are slashed. Outcast by the villainous Bonvilain, he must clear his name, and protect his home from this evil man, who is plotting against his parents, friends and sweetheart, the Princess…. In some respects, Airman seems very un-Colferish: we’ve gotten used to tales of fairies, criminal masterminds and super-abilities, and Airman is set in the 1800s. But what unifies this fantastic historical novel with the bestselling series Artemis Fowl is the fact that Conor Broekhart, the main character, is a genius. Not only that. Just as Artemis Fowl is set in Ireland, so too, is Airman. Well, to a certain degree… Which is fantastic, in my opinion. It’s unusual to find bestselling books being set on Irish land, and it makes a nice change. 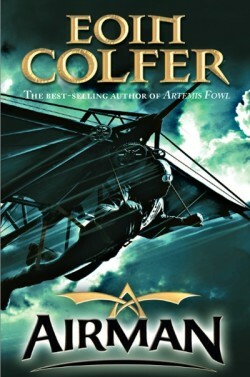 Like many who have read Airman, I picked it up not for a love for the story, but because Eoin Colfer penned this work. I’m glad I did pick it up: it is a fantastic read in many respects, and a nice breath of fresh air in the fantasy and paranormal saturated markets of Young Adult novels. And while you may not think the synopsis is much to your taste, it is much a whole lot more than that, and I highly recommend you at least try reading Airman. One of the best features of Airman, in my opinion, are the characters. They are all fleshy characters, most (!) of them lovable and entertaining to watch. All of them are distinctly different, even the villain, who doesn’t seem to suffer from any archetypal syndromes. Conor Broekhart, particularly, is a great main character, and undergoes a some major character arcs which really make the book a gem. Linus, too, is unusual, and really shows Colfer’s natural ability at creating characters. The plot-come-lifestory also holds merit. Spanning over a number of years (although skipping many), it is the story of revenge, love, guilt and passion. All are spun into the story very well, and cause some interesting internal character conflicts, really bringing the characters alive. The plot itself seems much less of a plot than an exciting true story that sounds very plausible, which I liked a lot, as it didn’t seem like a normal book, but more of an exciting and fast paced historical account of what happened over 100 years ago. It’s extremely engrossing, and consequently, very hard to put down, much more so than many fantasy sagas, as it just feels very real. I haven’t ready Colfer’s books for quite a while, but I can still tell that the prose is similar yet different from Artemis Fowl. Instead of the more comic elements, it is much darker and gritty, something that really suits the premise of the book.